Volkswagen T-Cross Interior, Sat Nav, Dashboard | What Car? Although many buy an SUV for its higher driving position, rivals such as the Kia Stonic don’t feel any higher when you’re sat behind the wheel than a regular Small Car. 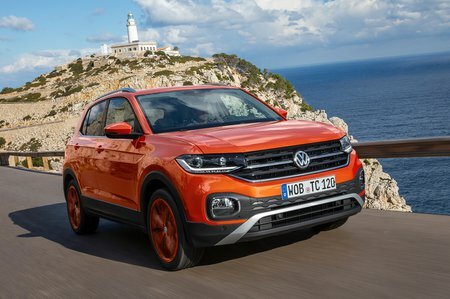 The T-Cross bucks this trend somewhat; while it’s no Range Rover in terms of driver elevation, it does at least feel higher than a Polo, which makes it feel more like a ‘proper’ SUV. Height aside, the driving position feels much like that of the Polo. There’s a wide range of adjustment to the seat and steering wheel, including standard height and lumbar adjustment on all trims, so it’s dead easy to get comfortable. The Active Info Display (standard on range-topping R-Line trim and optional on SE and SEL trims) replaces conventional analogue instruments with a 10.3in TFT screen in front of the driver. This may sound like a gimmick, but it presents an awful lot of useful information very clearly, including a large map if you have sat-nav fitted, and is something we’d recommend considering. That said, the standard analogue dials are extremely clear. Thin windscreen pillars keep the view forwards unobstructed but, like many of its rivals, the thick rear pillars are a hindrance when looking over your shoulder. Fear not though. Manoeuvring woes can be cured by adding the relatively inexpensive rear-view camera to our favourite SE trim, and possibly front and rear parking sensors if you’re a particularly nervous parker. The latter come as standard on from SEL trim. SEL trim also gets ultra-bright LED headlights as standard. SE trim comes with front fog lights that also switch on individually when you turn the ‘wheel at night, to help you see through corners. All T-Crosses have an 8.0in colour touchscreen as standard, along with USB connections, Bluetooth and DAB radio. Volkswagen Connect is also standard and keeps a special smartphone app updated with useful information. This includes notifications of the car’s servicing requirements, journey analysis and current location — just in case you’ve wandered off after leaving your T-Cross in some obscure side street..
Our recommended SE trim has Apple CarPlay and Android Auto smartphone integration, so you can use your phone’s apps through the touchscreen, including its sat-nav. In-built sat-nav is only standard on SEL trim, which also adds eCall emergency SOS assistance and a three-year subscription to various online services. Oddly, voice activation is reserved for the options list across the range — most competitors offer this as standard. Whichever trim you choose, the basic hardware and software remains the same and works just as well as it does in other VW models. The screen is sharper and more responsive than that of the Citroën C3 Aircross, with clearer graphics and more logical menu structures. The standard sound system comes with six speakers but can be can upgraded with the Beats Soundpack. This adds a subwoofer and boost power to 300 watts, but sounds a little bass heavy to our ears. Sadly, the T-Cross doesn’t mirror the cheaper Polo – on which it is based – for quality. 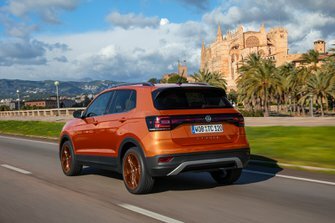 Everything feels well screwed together and should stand up to the rigours of family use but, where the Polo displays a mix of plush materials on the top of its doors and dashboard, the T-Cross presents a sea of hard, shiny plastics. It has a similar feel inside to the Arona and, considering that VW touts this as something a little higher end, that seems a bit of a shame. At least you have the option of jazzing it up a little with a range of trim packages; you can add coloured and textured dash panels, as well as ambient lighting that provides a bit more atmosphere at night.